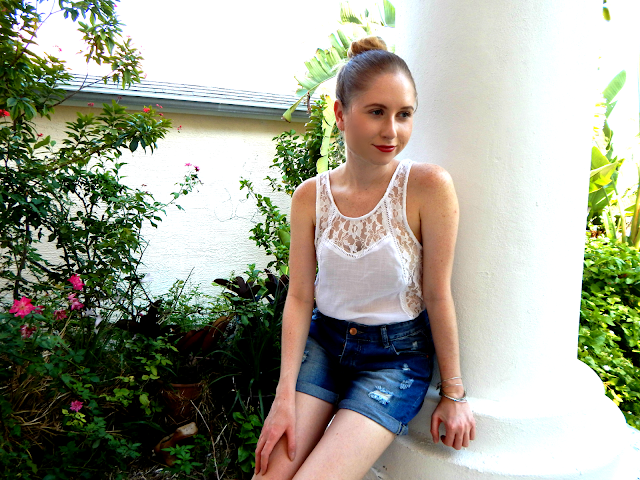 I may still be obsessed with the loose look of the boyfriend denim short trend! These I bought in the beginning of the summer from Cotton On for $15. These options are also fantastic compared to the boyfriend jean shorts I've seen for over $100--these light-wash pair are $25, or these distressed ones for $22! I've been wearing mine so much because they just make an outfit go from your run-of-the-mill "jean cut-offs & a top" to slouchy & effortless. The delicate lace top combines feminine texture with the ease of throwing on these boyfriend shorts. My slightly red lip color is from a product I love but have yet to talk much about on the blog--my Nivea Lip A Kiss of Cherry. The result is a light red tint that feels buttery smooth! It adds just the right amount of color.